Mary, our happy girl in her cart. “DOGS TO GO” is a family owned and operated business. We take great pride in building each custom wheelchair by hand. We have been building our custom wheelchairs for pets since 1999. 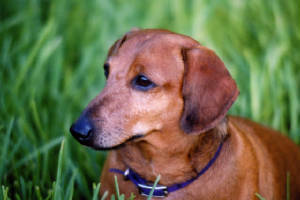 Our own little dachshund, Penny, then only 3 years old, suffered a ruptured disc and went immediately to surgery, but her prognosis for regaining her ability to walk was very guarded. We realized three weeks post operatively, we would need a cart for her. So I began my search. 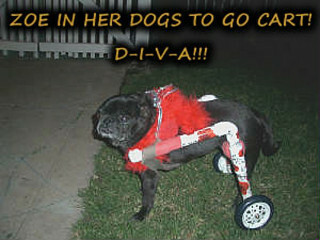 Unfortunately, the wheelchairs on the market at that time were way out of our price range! 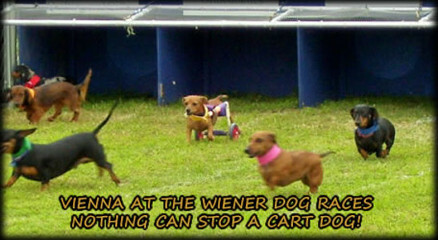 So Larry, being the inventive soul that he is, through much trial and error, designed a great little cart for Penny. It was simple in design and it allowed her to be independent again. 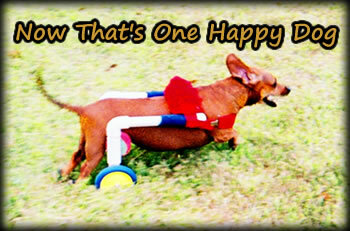 Dachshunds, as those of you who own them know, are happy when they can hunt, sniff and run around freely. Our Penny was once again happy. 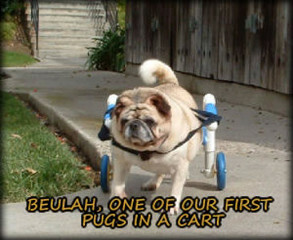 Since then, we have built over 10,000 carts for all kinds of pets. We currently ship them Worldwide. We also have over 2000 pets who have continuously used their dogs to go cart for over 10 years, including our own schnauzer, Mary. So, we KNOW they work! Mary & Penny in Their Original “Dogs To Go” Carts. Let us be your guide to helping your pet regain his or her love for life. We know this is a difficult time for you, and we are here to help you through it. Cruise our site and if you have any questions, please feel free to contact us. 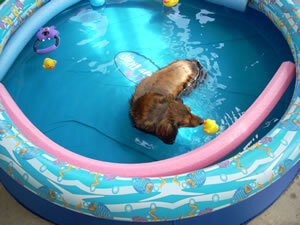 (Dogstogo19@aol.com) We are here to help! 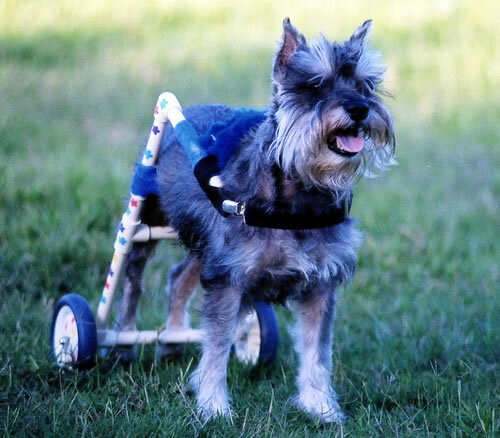 “CARING FOR A DISABLED PET – HINTS AND HOW TOs FOR DAY TO DAY LIVING WITH A DOWN DOG”. Our detailed instruction manual for owners of recently disabled pets is written by Laurie Miller, RVT and covers everything you need to know once you have your pet back home. 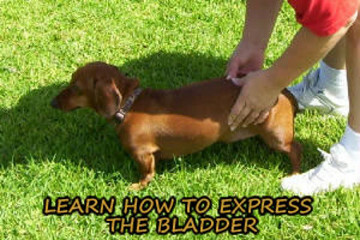 It is packed with information to make caring for your pet stress free and it also helps you to begin rehabbing your pet with simple, effective, proven exercises you can do at home. 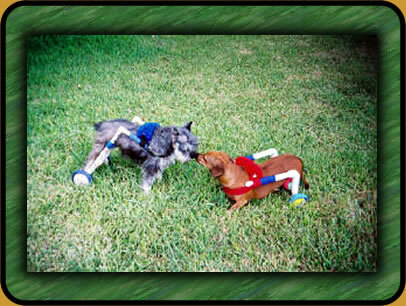 This manual is backed by over 25 years of work in a veterinary surgical specialty practice and was made possible by contributions from many board certified surgeons and professionals trained in companion animal rehabilitation. GO TO OUR “MANUAL” PAGE TO READ MORE ABOUT IT! 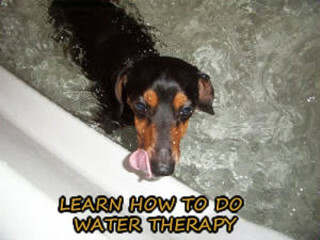 Learning to walk again using water therapy.